The JCC Filmfest, College of Charleston Jewish Studies Program, and Charleston Jewish Federation’s REMEMBER Program for Holocaust and Genocide Awareness proudly present a screening of “MY DEAR CHILDREN.” Nearly 100 years ago, Feiga Shamis sent her two young children to an orphanage a continent away. Twenty years later, she hand-wrote a 174-page letter to her children explaining her decision. The moving, eye-opening documentary based on this letter describes the anti-Jewish massacres in Eastern Europe following WWI — a tragedy that remains little known. Co-producer/Director LeeAnn Dance will offer a talkback following the screening. An award winning television producer and groundbreaking investigative reporter, Dance has worked as a freelancer in East Africa and as a producer with CNN’s investigative and documentary unit. 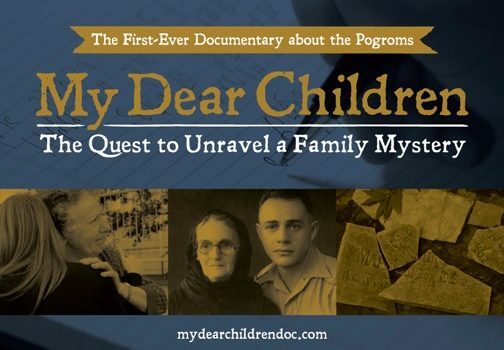 She now has her own boutique production company outside of Washington, D.C. “My Dear Children” is her first independent documentary. We are excited to attend this groundbreaking film. This is a story long in the making, one that needs to be told. I’m delighted Charleston will have the opportunity to view this special documentary. So delighted Charleston will have the opportunity to see this outstanding documentary.